NEW HYDE PARK, N.Y., Oct. 4, 2018 — (PRNewswire) — Formlabs and Northwell Health announced today that the powerful and accessible automated 3D printing system Form Cell has been incorporated into Northwell's 3D Design and Innovation Center to increase production of patient-specific anatomical models and surgical guides. 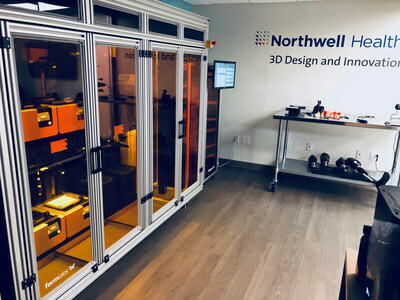 Northwell Health – New York State's largest health care provider with 23 hospitals – has already used Formlabs' standalone Form 2 3D printers in its 3D printing lab, but looks to increase production with the Form Cell, an automated 3D print production solution. Personalized models provide surgeons with more effective preparation, offering a hands-on opportunity to get a feel for patient anatomy, and pre-fit equipment before entering the operating room. During orthopedic or oncologic procedures, surgeons are now able to use patient-specific, 3D-printed surgical guides, which help with precise excisions of tumors or drill depths for optimal screw insertions. The benefits of the partnership are evident to Barnaby Goberdhan, whose son, Isaiah Onassis Goberdhan, age 7, recently utilized a 3D printed model of the youngster's palate to physically visualize the procedure and talk through the surgery. Mr. Goberdhan visited a Northwell Health physician because his son had trouble breathing through one of his nostrils. The checkup revealed an aggressive tumor in his palate and nasal cavity. Isaiah needed surgery to remove the tumor, so the family met with Neha A. Patel, MD, a pediatric otolaryngologist at Cohen Children's Medical Center in New Hyde Park, NY. "Having a 3D printed depiction of my son was really helpful when talking with the doctor about his surgery," said Mr. Goberdhan. "The doctor was able to do more than talk me through what they were going to do – Dr. Patel showed me. There is almost nothing more frightening and stressful than having your child go through surgery. There were several options Dr. Patel walked us through for the best way to preserve Isaiah's teeth and prevent additional cuts within his mouth. I wanted all of my questions answered so I could be less fearful and more prepared to talk my son through what he was about to face. I wanted Isaiah to feel prepared. With the 3D model, we both felt more at ease." Dr. Patel worked with Todd Goldstein, PhD, and his 3D Design and Innovation Center to develop the 3D model for Isaiah. From Isaiah's CT and MRI scans, Dr. Goldstein was able to create a personalized 3D rendering of his mouth and nasal cavity. Dr. Goldstein used Formlabs industry-leading 3D printing technology to print an anatomical model with the tumor in place as well as removed. A recent study based on Northwell Health data shows the use of 3D printed models or surgical guides for complex cases can reduce time in the operating room by at least 10 percent. This shows significant savings, for instance, assuming 10-15 percent of select surgical cases could use a 3D printed model or guide, the annual operating room cost avoidance for 1,150 annual cases would be approximately $1,750,000. Based on these findings, within four years models printed on the Form Cell could save Northwell Health approximately $7 million in operating room time alone. "As a part of Northwell's multidisciplinary team, I had the opportunity to work with Dr. Dev Kamdar from Head and Neck Surgery, Dr. Ken Kurtz from Prosthodontics, and Dr. Korgan Koral from Neuroradiology to formulate a treatment strategy for Isaiah," said Dr. Patel. "It wasn't until we worked with Dr. Goldstein's team that we were able to incorporate 3D printing into our surgery and really bring Isaiah's family into the shared decision making process. The 3D models help me explain surgery to patients and plan for surgery. In Isaiah's case, I wanted to be able to visualize where the tumor was and to determine whether we could preserve key structures in the area. The palate and nasal cavity is a delicate area, close to the orbit and dentition. Precision is key and the 3D-printed model helped us get very accurate." Dr. Patel and Dr. Kamdar conducted the surgery in April 18. Today, Isaiah is healed and doing well. Isaiah can now breathe out of both nostrils, allowing him to run and play like other children. "Before the surgery, I had trouble breathing in and out of my nose, which made it hard for me to keep up with my family and friends at school," said Isaiah Onassis Goberdhan. "The surgery was fine and now I'm able to breathe so much better." Now with the Formlabs Form Cell, Northwell will be able to scale production of anatomical models and surgical guides, bringing this pre-planning and explanation capability to even more patients. Visit https://formlabs.com/industries/healthcare for more information. Northwell Health is New York State's largest health care provider and private employer, with 23 hospitals, 665 outpatient facilities and more than 18,500 affiliated physicians. We care for over two million people annually in the New York metro area and beyond, thanks to philanthropic support from our communities. Our 66,000 employees – 16,000-plus nurses and 4,000 employed doctors, including members of Northwell Health Physician Partners – are working to change health care for the better. We're making breakthroughs in medicine at the Feinstein Institute for Medical Research. We're training the next generation of medical professionals at the visionary Donald and Barbara Zucker School of Medicine at Hofstra/Northwell and the Hofstra Northwell School of Graduate Nursing and Physician Assistant Studies. For information on our more than 100 medical specialties, visit Northwell.edu.